Soak up the sun in Losone, from this well-placed ground floor retreat with parking space & terrace! 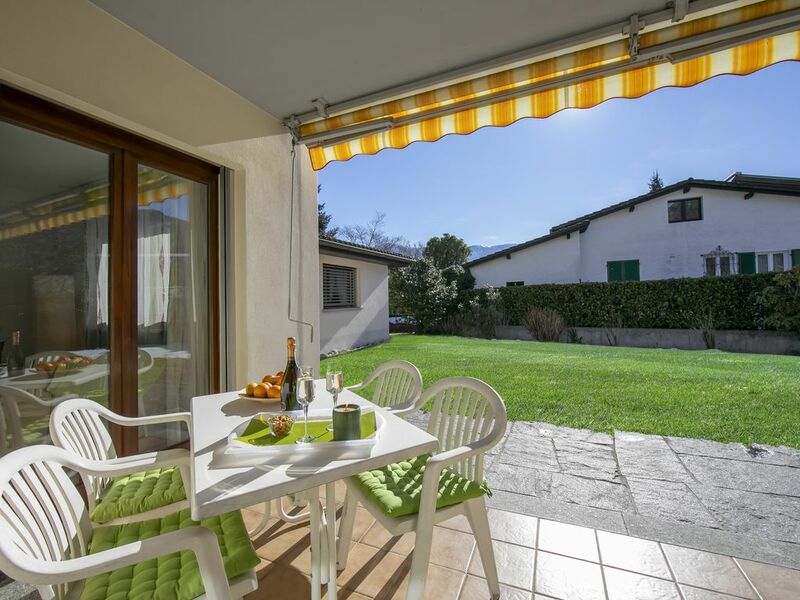 Perfectly placed for reaching the nearby golf club and touristic riverside area of Meriggio, this modern 2-bedroom apartment provides a welcoming base for year-round stays. The accessible ground floor apartment is well presented throughout and ideally suits families and groups of 4. Within the modern and inviting living room, a flat screen TV with DVD player, games console and kid’s book-games library provides timeless amusement, whatever the season. A well-equipped kitchen diner is also on hand for carefree meals in. The light and spacious room leads out onto a small sunny private terrace with sun awning and outdoor dining set. The sleeping accommodation comprises of a spacious double king-size bedroom and an inviting guest bedroom with 2 single beds. A spacious family bathroom is accompanied by a 2nd shower room and ironing facilities. Free WiFi features throughout the holiday apartment. Outside, the alfresco dining area is accompanied by a private on-site parking space. From its central location, the amenities and resort highlights of Losone and within easy reach on foot, or by car. The tourist towns of Ascona and Locarno are also nearby, 6-8 minutes’ drive away. The charming apartment is situated in Losone Campagna, along the secondary road ‘Via Casa del Frate’, just 250 metres from the famous touristic area of Meriggio. The holiday apartment is also perfectly placed for a game of golf at the local ‘Golf Gerre Losone’ club, 3 minutes’ drive away. For those arriving by public transport, the apartment is 500 metres away from the local bus station. Local highlights include visiting the tourist attractions of Ascona and Locarno (6-8 minutes’ drive away). The holiday home is placed 50 minutes’ drive from Lugano Airport and 1hr 37 minutes’ drive away from Milan Malpensa Airport.